We now have the facility to search SOLO/OLIS, OxLIP+ and e-journals from a search box on both our webpage (under the picture on the front page) and in the sidebar of the blog. So if you’re on our website or the blog and want to check on a reference or access electronic resources, you can do so directly! 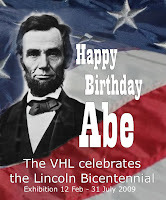 To celebrate Abraham Lincoln’s Bicentennial on 12 February 2009, the VHL is running a small exhibition. Exhibits include an account of the day of his birth (in a blizzard as well as a log cabin), two early 20th century treatises questioning his lineage and parentage (no, he does not descend from the Linkhorns), an illustration of a patent he was given for “A contrivance for Lifting a Boat over Shoals” and a reproduction of the earliest known photograph of Lincoln (a 37-year old Congressman). 1. Lincoln was the first president to be born outside the original thirteen colonies. 2. Lincoln shares his birthday with a certain Mr Charles Darwin. 3. He is the tallest president at 6 feet 4 inches. Obama is believed to be 6 feet 2 inches. 4. Lincoln is the only president to be issued with a patent. On 22 May 1849, he received Patent 6469 (“A Contrivance for Lifting a Boat over Shoals”). In the end, his invention was never manufactured. The Exhibition will run until 31 July 2009. Transcripts and audio clips of Kissinger’s telephone conversations are now available as part of the Digital National Security Archive (via OxLIP+). To search or browse this collection alone, tick the relevant box on the ‘documents’ page (link on the left hand side). If you scroll down this screen there is also an option to restrict your search/browse to audio clips only. Related to this, the Miller Centre of Public Affairs makes freely available a selection of more transcripts and recordings of telephone calls and speeches for Roosevelt, Truman, Eisenhower, Kennedy, Johnson and Nixon. See http://tapes.millercenter.virginia.edu. Due to the severe weather, the Bodleian van will not be making deliveries to other libraries today. This means that no stack requests will arrive in the VHL. If you need to see stack material today (and haven’t yet put in a request), you will need to go to a Central Bodleian reading room. Stack requests from the VHL stack are not affected! Google Scholar offers a very convenient method of retrieving article citations and often the accompanying full text, and is growing in popularity. This session offers tips on using it effectively and extending your search to other sources should Scholar’s coverage prove inadequate for your purposes. Full WISER programme and more information at www.ouls.ox.ac.uk/wiser. The list of books received in the library in January is now available on our website and LibraryThing page.